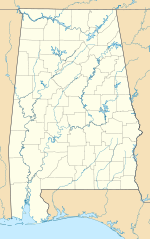 Guntersville Municipal Airport (FAA LID: 8A1), also known as Joe Starnes Field, is a city-owned public-use airport located three nautical miles (6 km) northeast of the central business district of Guntersville, a city in Marshall County, Alabama, United States. According to the FAA's National Plan of Integrated Airport Systems for 2009–2013, it is categorized as a general aviation facility. Airport covers an area of 55 acres (22 ha) at an elevation of 615 feet (187 m) above mean sea level. It has one runway designated 07/25 with an asphalt surface measuring 5,005 by 75 feet (1,525 x 23 m). For the 12-month period ending July 13, 2009, the airport had 9,217 aircraft operations, an average of 25 per day: 99% general aviation and 1% military. At that time there were 39 aircraft based at this airport: 90% single-engine, 5% multi-engine and 5% helicopter. ^ a b c d FAA Airport Master Record for 8A1 (Form 5010 PDF). Federal Aviation Administration. Effective 3 June 2010.